Figure 1. Reduced-pressure backflow preventer required on public (municipal) water systems and domestic potable water sources. Diagram reproduced from the Cross Connection Control Manual (6th ed.) with permission from Pacific Northwest section of the American Water Works Association. Figure 2. Irrigation mainline chemigation valve. Reprinted with permission from Pierce Fittings. Figure 3. Example of a chemigation system for a pressurized irrigation system. Reprinted courtesy of Dr. Larry Schwanki, University of California. Chemigation is a term that is customarily defined as the application of chemicals, such as pesticides or system maintenance compounds, through an irrigation system. Comparatively, fertigation refers to plant nutrients (fertilizers, including organic compounds) and soil amendments applied by means of irrigation water. Fertigation, as a practice, has become more encompassing to include the irrigated application of reclaimed process water from food processing facilities and animal effluent (lagoon water). Generally, compounds used strictly for water treatment – such as a pH buffering material – may be exempt from chemigation regulations; however, state regulations should be examined prior to an application to determine the statutory status of these compounds. Because of human safety concerns and environmental contamination risks inherent with chemigation applications, irrigation systems intended for chemigation applications must be properly designed, equipped, and maintained. Furthermore, chemigation demands that operators possess the skill, training, and proficiency to safely set-up, calibrate, maintain, and competently operate a chemigation system. In fact, pesticide label instructions as regulated by EPA and states with chemigation regulations require that an applicator must be knowledgeable about the chemigation system (i.e., injection apparatus and irrigation system) and that the individual responsible for its operation, or that someone under the supervision of the responsible person, must be capable of shutting down the system and of making necessary adjustments should the need arise. A chemigation system includes the chemical injection apparatus and auxiliary equipment as well as the irrigation system. An irrigation system is inclusive of all components that comprise the irrigation water distribution infrastructure (e.g., pump, mainline, laterals) and application system (e.g., center pivot, solid set, dripline). No distinction as to ownership of components is made regarding the irrigation system or the injection apparatus. The applicator is responsible for the operation and performance of the entire chemigation system, regardless of component ownership. Chemigation requirements apply both to pressurized and to non-pressurized irrigation systems (e.g., furrow, rill, or flood). reduced risk of applicator exposure. additional cost of installation and maintenance of anti-pollution devices. Because of the risk of bystander exposure, chemigation may not be a suitable practice if the treatment site is near public areas (e.g., parks, golf courses, parking lots, walking trails), residences, businesses, schools, clinics or hospitals, or other high-risk sites that are vulnerable to overspray or physical drift. Before each pesticide application, the treatment site and surrounding area must be assessed to determine if the application will endanger or be a potential hazard to workers, bystanders, domestic animals, fish or wildlife, ground or surface water, or neighboring crops. If a pesticide has been authorized by the US EPA for chemigation, the product label must specify instructions for its use. These conditions of use include, in part, the following: (a) the type of irrigation system through which the product can be applied, (b) backflow prevention devices required on the irrigation water supply system to prevent contamination of the water source, (c) special antipollution measures for connections to public water systems, (d) backflow prevention devices on the chemigation injection line, (e) a system interlock to discontinue product injection in event of an irrigation system malfunction, (f) system flushing requirement, (g) application monitoring guidelines, (h) treatment area posting, and (i) the quantity of water to be applied. This information and other instructions usually appear under the label section “General Directions for Chemigation.” Safety devices are intended to prevent environmental degradation—primarily source water contamination resulting from a backflow event into the water source—and human exposure. If the US EPA has not authorized a pesticide for chemigation, the label must include the statement, “Do not apply this product through any type of irrigation system.” If the label makes no reference to chemigation, it is implicitly understood that the pesticide cannot be used for chemigation. Federal regulation and state chemigation laws or rules (if they exist) require safety devices on chemigation equipment to protect the source water from backflow, spills, and pollutant discharges. Properly selected, maintained, and calibrated equipment is vital to a successful—and legal—chemigation application. As written above, a chemigation application includes the irrigation system and the injection apparatus, and the applicator is responsible for the proper operation of both. Therefore, prior to each chemigation, the applicator should assess the operational integrity of safety devices and the mechanical soundness of the application and injection systems. Equipment performance should be routinely checked during an application. Operational and safety procedures should be confirmed with everyone involved in the application. Not all irrigation systems can be used to apply chemicals. If intended for use in chemigation, the pesticide label will specify requirements for the irrigation system and the injection apparatus. Additionally, many states have enacted rules that further govern chemigation as a practice. These rules consider geophysical characteristics, climatic conditions, product-related incidences, or pesticide use profile (rate, timing, or frequency) unique to that state. core competencies of pesticide handlers. Federal law requires that chemigation safety devices for the irrigation system and injection apparatus must be listed on the pesticide label, a requirement since April 1988. Label use instructions and restrictions or prohibitions are intended to mitigate environmental risks, such as pesticide contamination of source water; to minimize direct human contact to pesticide-laden irrigation water or to pesticide residue on equipment surfaces; and to diminish bystander exposure. In addition to the devices listed on the pesticide label, states with chemigation rules (and occasionally local ordinances) may stipulate additional equipment requirements, operational procedures, injection equipment placement restrictions, chemigation permits, system inspections, or operator certification. States with chemigation laws or rules require safety devices be appropriately sized (generally based on an industry-recognized or a professional society standard), correctly installed, properly functioning, and adequately maintained. Some states require laboratory testing of chemigation equipment to verify adherence to established performance standards prior to approval for chemigation use. Before undertaking a chemigation application, chemigation operators must understand label instructions and be knowledgeable about state laws and rules as well as local ordinances. Pesticide label instructions and state regulations governing pesticide use periodically change. Therefore, pesticide labels should be read and the instructions understood before each use, and state rules should be periodically reviewed for changes. Titles and section citations for the Idaho, Oregon, and Washington State chemigation rules appear below. Idaho and Washington State Departments of Agriculture, and the Oregon Water Resources Department, maintain a webpage on their respective websites that contains chemigation-related information. The Internet addresses for agencies with the legislated authority to enforce chemigation rules appear below. The irrigation system may include a physical piping connection between the application tank or chemical-laden water in the irrigation mainline and the source water through which backflow may occur; this is referred to as a cross connection. Backflow can result from either “back-siphonage” or “back-pressure.” Backflow safety devices are installed to prevent backflow of contaminates into the source water through cross connections. Back-siphonage is the reversal of normal flow in a pipeline towards the water supply when the pressure in the pipeline is less than the atmospheric pressure, resulting in a partial vacuum. The vacuum caused by a differential pressure gradient between two points in the piping system causes a siphoning action. An example of back-siphonage is water cascading down the wellhead casing at irrigation pump shutdown. Another example is pumping water over a hill with no or inadequate vacuum relief valve(s) at the pipe’s apex to vent the pipeline in the event of loss of head pressure at the pump. Back-pressure is backflow resulting from an increase in the downstream pressure that is above the water supply pressure. This can occur when the irrigation system is operating at a higher pressure than the water supply system due to booster pumps or cross connections with other higher pressure pumping systems. Back-pressure may also occur at shutdown if an irrigation system is at a higher elevation than the water source. Before considering a chemigation application, the irrigation system must be evaluated. In addition to being well-maintained and structurally sound, the system must have the required antipollution safety devices correctly installed and properly operating. In addition, the injection equipment must be compatible with the chemical being used. The distribution uniformity of the irrigation system should also be evaluated prior to a chemigation application. The distribution uniformity of the irrigation system can be determined through a field procedure utilizing “catch can” tests. Information collected from this test is used to diagram the application uniformity of an irrigation system. Poor uniformity causes uneven distribution, with some areas receiving too much water while other areas receive too little. Over- or under-irrigation to any portion of the application area means that pesticide applications are equally in error. With a higher distribution uniformity value, there is a greater likelihood that the same amount of water (and chemical) is being applied throughout the treatment site. A minimum distribution uniformity of 85 percent is recommended for pressurized irrigation systems. If the water source is dedicated only to irrigation, the backflow devices listed below are required on irrigation systems being used for chemigation. There are only two exceptions: An air gap or a reduced-pressure backflow preventer is used as the backflow device. (Some states may recognize engineering controls, such as a gooseneck pipe [barometric] loop. However, state statutes may require inspection and approval of engineering controls by authorized agency personnel.) US EPA has also authorized equipment not otherwise specified on the pesticide label. Prior to a chemigation application, state regulations should be reviewed for additional requirements. Backflow devices must be installed in accordance with manufacturer’s specifications or, in their absence, with accepted industry practice. Device placement and installation must also be compliant with state rules. Local ordinances (municipal or county) may require backflow safety devices other than those listed below. Safety devices must be inspected and maintained on a regular basis. An irrigation mainline check valve must be placed in the irrigation mainline upstream from the chemical injection point. The check valve is the principal mechanism to prevent contamination of the source water from backflow. The valve must be spring loaded and have a watertight seal. Accordingly, there should be no metal-to-metal surfaces where the check valve contacts its seat. Idaho State Department of Agriculture (ISDA) requires that check valves be tested and authorized by an independent laboratory before the device will be referenced in “Idaho’s List of Approved Chemigation Equipment.” Although Washington State does not require verification of device performance, it does consult the Idaho list of approved devices. However, if a cross connection is possible between a chemigation system and a municipal water supply, only those devices as approved by Oregon’s cross-connection control requirements in OAR chapter 333 or as listed in Washington State Department of Health, Drinking Water Division’s referenced USC-Approved Assemblies list (http://fccchr.usc.edu/list.html) can be installed. The landowner is responsible for testing the device to verify that it is installed and functions properly. They are also responsible for annual testing. A reduced pressure-principle backflow preventer (RPBA) is required when an actual or potential physical connection exists between a public (municipal) water system and any source of a non-potable liquid (such as pesticide or fertilizer-laden water), solid, or gas. The RPBA consists of two independently acting spring-loaded check valves separated by a spring loaded differential pressure relief valve (or atmospheric port; refer to Figure 1). The same cross-connection control requirements are applied to potable water sources for domestic use under the Idaho, Oregon, and Washington State chemigation rules. The vacuum relief valve vents air into the irrigation pipeline with the loss of system pressure such as at pump shutdown, thereby preventing a vacuum that could result in back-siphonage. The vacuum relief valve should be located at top dead center of the irrigation pipeline and upstream of the mainline check valve. A combination valve (air release and vacuum relief) may also be used. The valve should be checked periodically to ensure that debris has not jeopardized its proper operation. The size of the vent port is governed by the diameter of the irrigation mainline. If most of the irrigation system is a lower elevation than the pump, installation of a vacuum relief valve downstream of the mainline check valve will help prevent the potential collapse of the irrigation pipeline in the event of rapid pipeline drainage. The sump and low-pressure drain must be placed immediately upstream of the irrigation mainline check valve and at the bottom dead center of the pipeline. The sump intercepts leakage past the mainline check valve. Therefore, the sump collar, if it exists, should not extend beyond the inside surface of the bottom of the pipeline. The low-pressure valve purges leakage from the pipeline that can occur if the irrigation mainline check valve does not seal at irrigation system shut down. The low-pressure drain is a self-actuating valve with a 2- to 5-psi spring. The spring-loaded valve opens when pressure drops in the irrigation mainline, and then closes when the system repressurizes. The low-pressure drain should have an opening of at least 3/4-inch in diameter. Organic material and sand in irrigation water and high calcareous water can foul the valve. 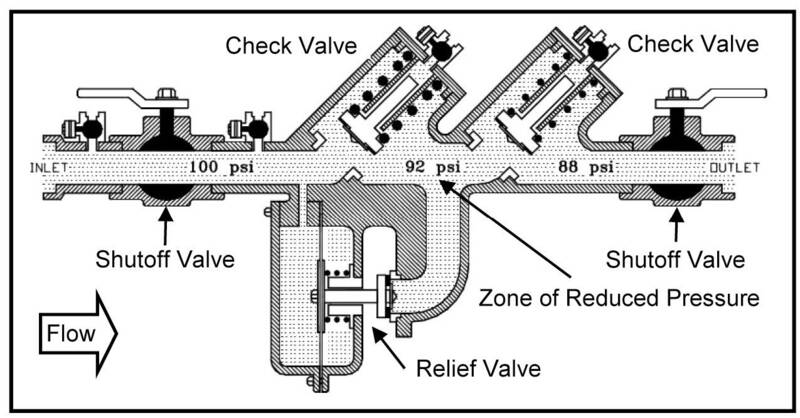 Valve operation should be frequently checked. If water continually leaks after irrigation system shut down, there is a good chance that the seal on the irrigation mainline check valve needs to be replaced. A drain hose of sufficient length to discharge check valve leakage at least 20 feet from the water source should be attached to the low-pressure drain. Although not usually referenced on pesticide labels, states with chemigation rules require an inspection port. (As pesticide labels are updated, an inspection port is being added as a required device). The inspection port allows access to physically manipulate and visually assess the operation of the irrigation mainline check valve and the low-pressure drain. Consequently, the inspection port must be positioned immediately upstream of the irrigation mainline check valve and directly above the low-pressure drain. To aid in the manual manipulation of the check valve and low-pressure drain, the access port should be at least four inches in diameter. A freshwater outlet at the injection site is not required. However, it is a convenient source of water for equipment cleanup, rinsing empty pesticide containers, mixing chemicals, or handler decontamination. The water outlet must be located upstream of the irrigation mainline check valve and as far as possible from the injection point. This will prevent the discharge of chemical-laden water through the outlet. The outlet should never be used as an injection port. Ideally, the port should be clearly labeled as “Non-potable Water” to prevent confusion by pesticide handlers and agricultural workers as a drinking water source. 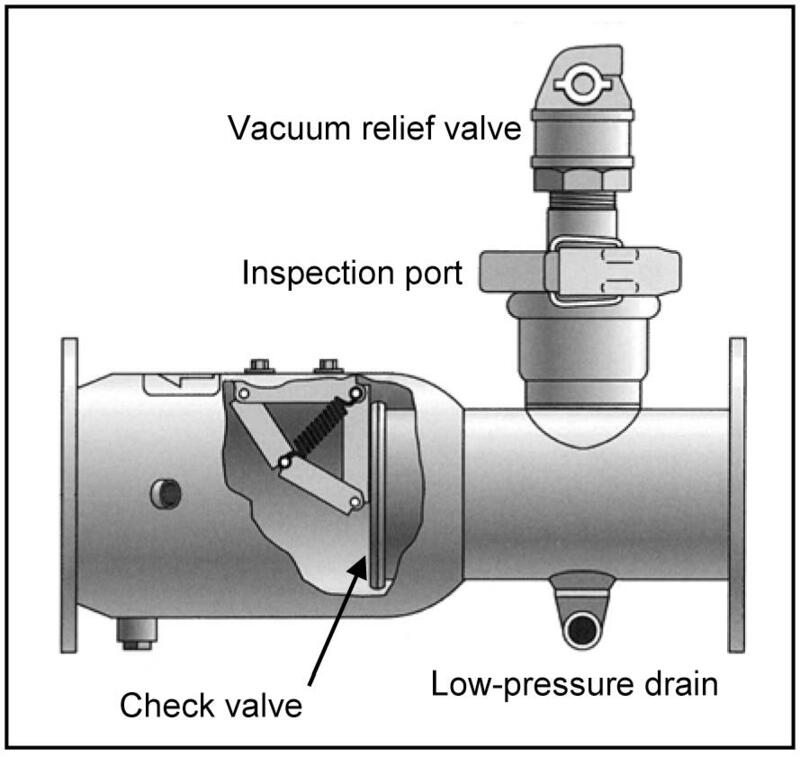 The mainline check valve, vacuum relief valve, low-pressure drain, and inspection port can be purchased as an integrated device, commonly referred to as a chemigation mainline check valve (see Figure 2). An approved irrigation mainline wafer check valve in combination with a “spool”—a device consisting of a vacuum relief valve, low-pressure drain, and inspection port—installed on the upstream side of the wafer check valve is the functional equivalent of a chemigation mainline check valve. The mainline check valve or a wafer check valve with a spool must be correctly installed on the irrigation mainline and be properly operating prior to the irrigation system being used for chemigation. Antipollution devices on the injection system prevent the backflow of water from the irrigation mainline through the injection line into the application tank. The devices also prevent drainage or siphoning of product from the application tank into the irrigation system caused by gravity flow or hydraulic gradient pressure. Besides wasting the chemical, the area around an overflowed application tank could be deemed as a contaminated site, requiring specific cleanup and disposal procedures. The chemigation section on pesticide labels contains the following statement about injection line check valves. However, US EPA has recognized alternative technology in place of the two devices referenced on the pesticide label. In accordance with the “List of US EPA Authorized Alternative Chemigation Safety Equipment,” an injection line check valve can be substituted for both a quick-closing check valve and a normally closed solenoid-operated valve. The injection line check valve must maintain, at a minimum, 10 psi opening (cracking) pressure. Higher opening pressure will be necessary if the injection point is lower in elevation than the application tank so as to compensate for hydraulic head pressure exerted from product in the tank. In situations where siphon action induced by irrigation system drainage could compromise the opening pressure of the injection line check valve, either a vacuum relief valve must be installed in the irrigation system downstream of the injection point or a normally open valve can be inserted into the chemical injection line between the application tank and the injection pump. The injection line check valve must be attached to the irrigation pipeline. The valve, including the pliable seal, must be made of chemical-resistant materials. Some states require use of a state-approved injection line check valve that has been tested by an independent laboratory to verify conformance with established performance standards. The system interlock will shut down the chemical injection unit when there is either a loss in irrigation water pressure or a reduction in irrigation mainline pressure that adversely affects chemical distribution. An electrical interlock is interconnected with the electrical controls at the irrigation control panel, the electrical power source for the chemical injection pump. Consequently, if the irrigation pump stops or if water pressure decreases below a preset range, the pressure switch will shut the electrical power off at the control panel, which will deenergize the electrical outlet that powers the injection pump. A dual interlock is advised. In the event that the injection pump shuts down, electrical interlock controls will shut down the irrigation system. Other interlock systems include the installation of normally closed solenoid valves—electric or hydraulic—in the chemical injection line between the application tank and the injection pump and between the chemical injection pump and the injection point on the irrigation system. Solenoid valves open when the pre-set activation pressure is attained in the irrigation mainline. Mechanical interlock systems can be coupled between an irrigation pump driven by an internal combustion engine and the chemical injection equipment from the engine’s electrical system or from an electric generator. 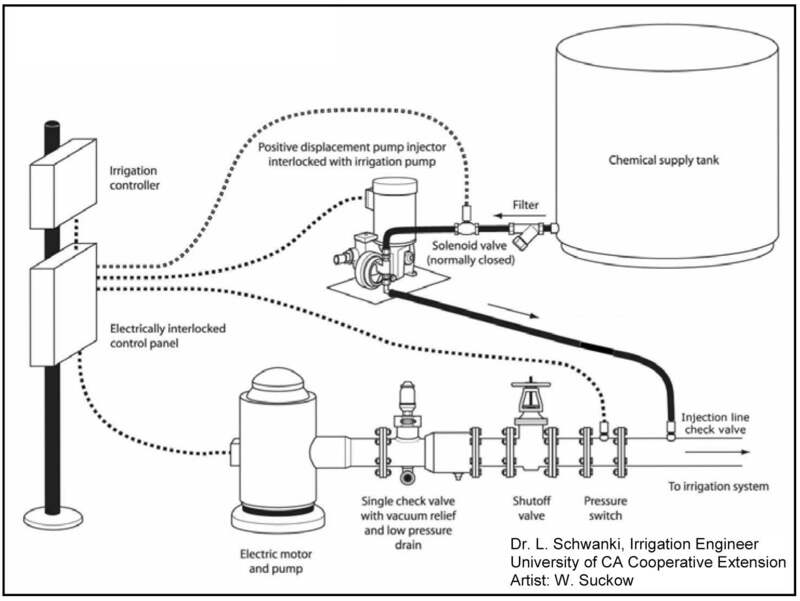 Figure 3 is an illustration of a chemigation apparatus used with a pressurized irrigation system. Many variations in design and set up are possible for a chemigation system. To verify the adequacy of a chemigation system, contact the state department of agriculture, or, in Oregon, the Water Resources Department, and request technical assistance from pesticide compliance staff or staff responsible for back-siphon prevention equipment. Before installing an injection system, check with state authorities or dealers about laws and rules governing injection systems in your area, including requirements regarding permits, pesticide record keeping and reporting, antipollution devices, and injection equipment construction. Local ordinances may also apply. The supervising applicator should calibrate the injection apparatus before each application and periodically throughout the application. Pump manufacture’s data provide a good starting point and may help decrease trial and error. However, the conditions under which the bench test is conducted by the pump manufacturer are different from that experienced under field conditions. Also, pump wear, temperature, and product density and viscosity will alter the pumping rate. Regardless of the type of pressurized pump, the procedure is generally the same when performing a calibration. Center pivot or linear (lateral) move speed should be performed with a fully charged irrigation system on firm wheel paths. The control panel setting should be set at the same speed that will be used during the chemigation. In addition to the chemical, the calibration process must consider the carrier (usually water) and adjuvants. Some chemicals require a dilution rate to keep the product in suspension. Also, to ensure that the injection pump is operated within 30 to 80 percent of its output range, it may be necessary to increase the bulk volume by adding water into the application tank. An injection pump should never be operated near or at its minimum or maximum output. Care should also be taken to ensure that the injection point is not too near the first sprinkler. To ensure ample mixing of the chemical in the irrigation mainline, the injection point should be located at least 10 pipe diameters upstream of the first sprinkler. Throughout the chemigation application, the injection equipment and irrigation system should be periodically inspected for proper operation. Some chemigation labels, particularly soil fumigant labels, specify how often a chemigation system must be monitored. Many states, such as Washington, specify how often a system must be checked to determine proper function. A chemigation application should be immediately discontinued whenever it poses a risk to people, sensitive environmental areas, or to property. To ensure handler safety, the area around the control panel(s), water pump, application tank, and injection pump must be free of chemical residue. To minimize the potential for human exposure (as well as electrical hazard), it is recommended that nozzles that overspray injection equipment or electrical control panel(s) be disabled throughout the application. A description of the inspection procedure and the frequency at which system monitoring will occur should be written in the operation plan. While at a chemigation site, it may be prudent to record weather conditions (e.g., wind speed and direction, temperature), document injection or treatment site observations, and confirm injection calibration. Applicators often maintain “Run Logs” or “Chemigation Worksheets” for this purpose. The federal and state-adopted Worker Protection Standard regulations require all workers involved in any aspect of handling, mixing and/or loading, or applying a pesticide must be trained as a pesticide handler or must have a pesticide license. The WPS requires agricultural employers and commercial pesticide handler employers to provide specific information and protections to workers, handlers, and other persons when WPS-labeled pesticide products are used on agricultural establishments (i.e., farms, forest operations, plant nurseries, or enclosed space production) in the production of agricultural plants. It also requires owners of agricultural establishments to provide certain protections for themselves and their immediate family, requires handlers to wear the labeling-specified clothing and personal protective equipment when performing handler activities, and to take measures to protect workers and other persons during pesticide applications. Carefully read the “Agricultural Use Requirements” section and comply with all EPA requirements regarding WPS on the pesticide label. As with any other method of pesticide application, chemigation activities require that personal protective equipment be worn. The extent of personal protection equipment required is dependent on the task(s) being performed and chemical applied. At a minimum, applicators and other pesticide handlers must wear a long-sleeved shirt, long pants, shoes, socks, and, at times, chemical-resistant gloves and protective eyewear. Additional personal protection equipment is generally required during mixing and when repairing or handling contaminated equipment during an application. Before setting-up equipment, the “Personal Protection Equipment” section of the pesticide label must be read to ensure that proper personal safety equipment is available and, if necessary, that applicators and other pesticide handlers have been properly trained in its use. For respirator use, the individual must be medically qualified as well as trained and fit-tested on the manufacturer type, model, and size of respirator that will be worn. To ensure a safe and effective chemigation application, observational procedures, operational policies, and an emergency response protocol should be detailed in a written plan. The plan should be maintained at the application site and available to anyone involved in the chemigation application. The Operation and Maintenance Plan should include maintenance and troubleshooting guidelines or checklists that will guide those involved with the application to more skillfully perform chemigation-related tasks, including the inspection process, maintenance requirements, and troubleshooting procedures. A pre-application site assessment should also be a component of the plan. The perimeter of the treatment area should be visually inspected for the presence of adjoining sensitive areas or of unauthorized personnel. An appraisal should also be made of backflow devices, injection equipment, and the overall irrigation system. Site hazards should also be noted and, if possible, corrected. To protect the applicator, pesticide handlers, agricultural workers, and bystanders, a current emergency response plan must be readily available to assist applicators, coworkers, or emergency response personnel in case of a pesticide accident or spill, an environmental contamination event, or human injury. The existence of a plan will also help to reduce the potential for human health risks or to mitigate environmental hazards. Beginning with the Phase I (December 2010) soil fumigant labels, EPA will require the preparation of a written, site-specific soil fumigant management plan (FMP) prior to each application. These written plans, which outline response procedures in the event of a mishap, will help prevent fumigant-related accidents and bystander exposure or to effectively mitigate events should they occur. The FMP will include many of the elements referenced in the Operation and Maintenance Plan and in the Emergency Preparedness and Incident Response Plan. After completing every chemigation application, the chemical injection pump, injection line, application tank, and other equipment should be flushed with untreated water to prevent precipitates (chemical deposits) from forming and to purge all chemical residue from the lines. Tank rinsate should be injected into the irrigation system and applied onto the target area. The irrigation pump should be operated until the chemical is flushed from the irrigation system and until residue is washed from system surfaces. Flushing the injection and irrigation system reduces the potential for human exposure from contaminated surfaces, minimizes the potential for system corrosion and accumulation of precipitates, and decreases the potential for product incompatibility with subsequent chemicals. Generally, the irrigation system should be flushed at least for the same length of time that was necessary to fully pressurize the irrigation system. Another practice is to inject a fluorescent dye solution at the end of the chemigation application to track water movement through the irrigation system to ensure that treated water has been purged from the irrigation system prior to irrigation pump shut down. Anyone who chemigates must comply with relevant federal regulations and state laws or rules. Rules are sometimes revised and new ones come into effect. For this reason, pesticide labels should be read before each application and personnel with the department of agriculture or the duly authorized environmental agency should be regularly consulted to determine if state laws or rules have changed. Chemigation demands a high degree of training and skill in handling chemicals and in setting up, maintaining, and calibrating equipment. As with any method of pesticide application, human safety is a primary concern and potential environmental hazards must be assessed and minimized. It is the applicator’s responsibility to demonstrate that an operation will not result in reasonably foreseeable harm to humans, surface water, groundwater, or desirable plants or animals. Before each chemigation application, the irrigation system and the injection equipment must be evaluated to assess its integrity and to evaluate its performance in accordance with manufacturer’s specifications, established industry standards, or state rules. It is also the operator’s responsibility to ensure that safety equipment is installed and is functioning properly, and that the injection system is correctly calibrated - regardless of ownership. The applicator must understand the operation of the irrigation and injection systems and be familiar with the required safety equipment. The applicator of record is ultimately responsible for all aspects of a chemigation application. Applicators, pesticide handlers, and agricultural workers must be protected by means of proper oral notification and/or field posting, appropriate decontamination supplies, suitable PPE, and adhering to restricted-entry intervals. Agricultural workers should be alerted that equipment may be contaminated with pesticide residue. Site safety necessitates that a pesticide accident and spill response plan also be in place prior to and readily available to pesticide handlers throughout the application. Site assessments should be undertaken to determine the location of sensitive areas and hazardous conditions. Because of poor distribution uniformity and issues with overspray and physical drift onto non-target areas, it is recommended that endguns be disabled throughout a chemigation application. Additional information about chemigation guidelines is posted to the above-mentioned websites. If you have questions about chemigation as a practice, state chemigation rules, or pesticide label instructions, please contact the following individuals in the respective state for which the question applies.